When the big guns let rip atop the final climb today Dan Martin was in the thick of the action. And now he has moved up the general standings and is only one place off making the final podium. Dan Martin was distanced by Adam Yates and Alejandro Valverde today in Spain but when the road went up the Irishman was among the very best. He finished 5th on stage four of the Volta a la Comunitat Valenciana which featured 4km of climbing to the finish line. After almost five hours in the saddle it was Adam Yates who probed best; the Mitchelton-Scott man lighting up the final kilometre. As the last of the breakaway had been swept and the peloton and had been whittled down to a select group, it was clear the race lead would change hands. Yellow jersey Edvald Boasson Hagen (Dimension Data) had proven no match for the gradient on the final climb and his challenge fell away. And as the leaders edged towards the finish for what looked like a sprint atop the climb from the select group, Yates took the initiative. Yates struck out about 400 metres from the line. And once he did, the matter was settled. Valverde, who won this race last year, went after him. And while the Spanish veteran finished on the same time as Yates, it proved a comfortable win for the British rider. Once he surged forward gaps immediately opened in the lead group. And as daylight began to emerge between the eventual winner and the others, it was clear Valverde was the only one with the legs to react. 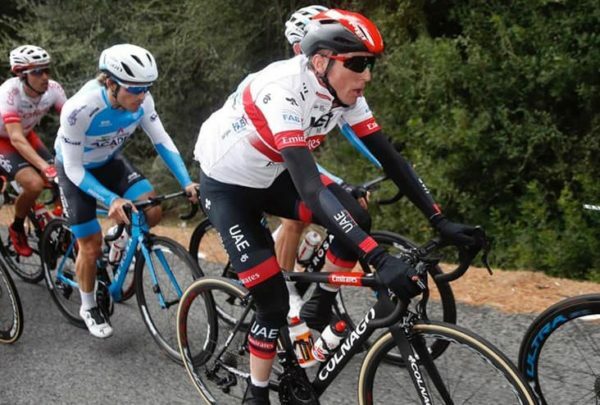 Dan Martin (UAE Team Emirates) looked labored and was fighting to stay with the others as Yates went forward and Valverde went after him. Ion Izagirre (Astana) was the best placed rider overall in the group and he was brought to the line by team mate Pello Bilbao Lopez de Armentia. Izagirre took 4th and was just three seconds down on Yates, with Martin another second back in 5th place. The result saw Izagirre take the yellow jersey with just tomorrow’s relatively flat final stage remaining. He now leads by seven seconds from Valverde, with Bilbao on the same time as him in 3rd. Then comes Dan Martin, in 4th place at 16 seconds. He was 10th on the opening stage TT and since then has nudged up the standings each stage. While he has developed a handy trick of bullying his way into the top three on stage races on the final day, that looks like a tall order tomorrow with nine seconds to make up.